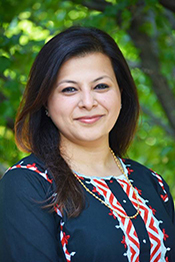 On Wednesday, August 22, 2018, from 2–3 PM EDT, Sapna Punjabi-Gupta, MS, RDN, LD, AP, will explore evidence-based research regarding the importance of diversifying the gut microbiome and its correlation to spices, incompatible food combinations and more. The time is right to analyze the connection between ancient wisdom and modern evidence to help nutrition professionals focus in providing an integrative approach to improve maintenance of gut health and well-being for patients of all ages. Sapna Punjabi-Gupta, MS, RDN, LD, AP, is a Registered Dietitian Nutritionist, Ayurvedic Practitioner, and a Culinary Wellness Expert. She combines her Indian roots and western training to inspire and educate by emphasizing mindful eating, the healing power of food, spices, and several Ayurvedic practices as strategies to improve one’s overall health and wellbeing. She is the creative force behind her company, BeSpiced (www.bespiced.com) and conducts wellness workshops, interactive cooking classes, and also offers a line of heirloom spice products. Sapna’s YouTube Channel - Be.Spiced (https://www.youtube.com/bespiced) provides a visual access to culinary wellness combining her personal stories and recipes for a modern palate.